The complexity of the Dutch adpositional phrase is highly interesting from a syntactic and semantic point of view. 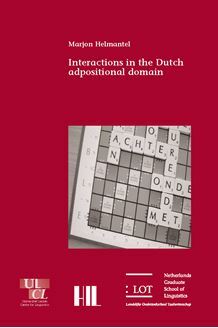 This thesis provides an overview of the Dutch PP and special attention is paid to interactions in the adpositional domain. The first part of this book presents a descriptive overview of the Dutch adpositional domain. On the basis of the characteristics found for the various adpositional constructions the second part provides (generative) theoretical analyses for the internal structure of simplex and complex PPs and length modification. The third part of this thesis is concerned with case studies, investigating the interaction between the internal syntactic structure and the PP’s external syntax. Studies of extraposition and R-word PP formation confirm that the internal syntax of the PP interacts with (and often restricts) the PP’s external syntax. Interaction between syntactic and semantic structure is argued to be found with length modification and the formalisation of directionality. This study is of interest to anyone concerned with adpositional constructions, as well as a general syntactic and semantic readership.